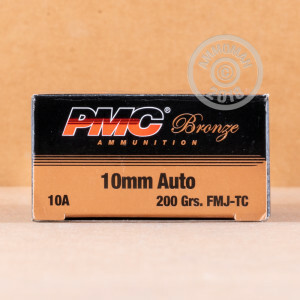 This 10mm Auto ammunition from PMC offers reliable performance on the range and comes in a 1,000 round case that's sure to help you keep your costs down. Each round in this case of 1,000 fires a heavy 200 grain full metal jacket bullet at a muzzle velocity of 1,050 feet per second. This makes it a full power 10mm Auto cartridge rather than one downloaded to .40 S&W specs. 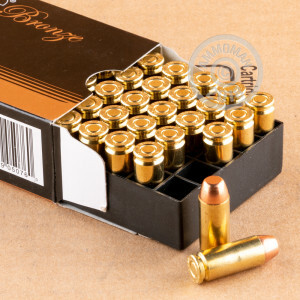 PMC ammo is made in South Korea and uses non-corrosive Boxer primers and reloadable brass cases. Pick up this case or any other items totaling $99 or more from AmmoMan.com to get free shipping!